There have been some big changes since I first made this, however, much of the information is still applicable. You can now pick up and hand in writs in any zone. I haven’t taken a provisioner through the levels for a long time so I don’t know if the level / coldharbour prerequisites are still applicable. I’ve left the information as is, as I’m sure it’s still relevant in some way. A huge thank you to Truthsnark for allowing me to complete this spreadsheet using the information (s)he compiled on the official forums. NB. You can buy or be given the required food/drinks to hand in (make sure they are green crafted items not white looted items). The writ recipes are available from the Chef and Brewer found in pubs / near cooking areas. 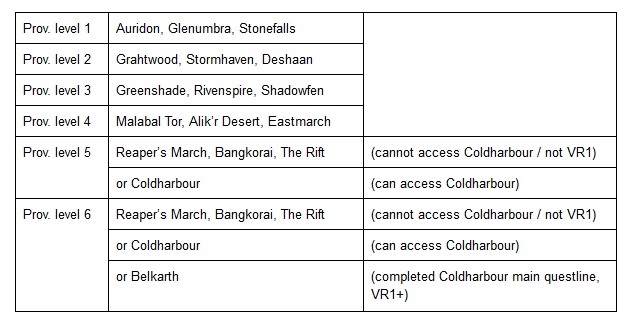 The writs can get quite complicated in the higher levels as the writ you receive depends upon a) your provisioning level b) whether you can access Coldharbour c) whether you have finished the Coldharbour questline and d) whether you can access Belkarth, Craglorn. I’ve left this as is, although you can now pick up and hand in your writs in any zone. Note for low level crafters jumping into coldharbour to do highest non-vet writs- you must speak with the caretaker npc in the front gate and complete the dialogue before it gives you access to level 5 writs. To do anything higher than 5 you must be veteran rank (it will not let you teleport to craglorn).